PT Cruiser came the Chevy HHR, copying everything but the styling, and the FJ Cruiser, a retrocar based on a real part of Toyota's history - the famed 1970s Land Cruisers, safari vehicles of the world. Back then, the Land Cruiser wasn't so much a luxury vehicle as a tough, go-anywhere wagon. The FJ Cruiser retains the FJ wagon's basic exterior look, at least in front, albeit with a measure of artistic license; and it goes back to the FJ's basic intent as well. 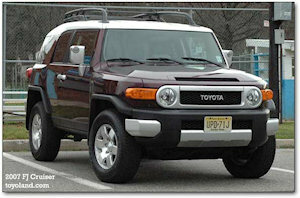 The FJ Cruiser looks modern outside, with its 1970s styling cues carefully brought up to date; inside, it has the old-fashioned 4x4 square shape, with the windshield placed far away from the driver, and an engine and transmission that seem to have been tuned as faithful reproductions of the originals. The big engine is a V6 instead of a straight-six, true, but it is still torque-biased and makes a loud truck-engine roar instead of the more modern muscle-car sounds that are in vogue. The shifter has an unfashionable long throw, requires effort to shove into gear (but you know when it's there), and throbs with engine vibration. The clutch remains fairly light and very easy to work smoothly, as we've expected from Toyota for decades. Inside, the styling is almost entirely modern, with notable exceptions. The instrument panel, with more complete instrumentation than most modern cars (speedometer, tachometer, temp, battery, and gas), has a smooth, even white electroluminescent background. While the keys go right into the dashboard - a retro idea when first brought back by the Impala, but gaining traction in non-retro cars as a cheaper, easier way to do it in this age of airbags - stereo controls are on the wheel, and the wipers, headlights, and cruise are on the stalks. The stereo is modern-trendy on the verge of looking cheap, handling MP3 and boasting an aux jack, with folder navigation for MP3 data discs. The climate control goes back to retro, with huge knobs (for use with gloves), and buttons for recirc, rear defrost, and the a/c compressor; heat comes up quickly. Our test car had the optional instrumentation package, with the outside temperature (digital), an inclimometer (for fore/aft and side-to-side tilt readings), and an analog compass which we strongly suspect was electronically driven. All are backlit at night in night-vision-friendly amber. The rest of the interior is light gray above the window-line, black below, and dull-silver-accented in the door handles, vertical dashboard elements, and steering-wheel elements. Cupholders and the like are all black, as are the tough rubber floor-mats (another concession to utility and past conventions). The exception to the color scheme, again paying homage to the PT, is the center stack bezel, which reproduces the exterior color (presumably depending on the color). The interior, as a whole, is rather unfortunate in its styling, in our opinion, but the driver has the best of it, especially at night, when the gauge cluster is rather nicely done. It does give a great feeling of spaciousness, thanks to the square shape that keeps the windows far away from the passengers - particularly the windshield, an almost perfectly rectangular window so long Toyota put in three windshield wipers. That's a first for us, and it works very well at keeping the windshield clear - and the smaller wiper blades should last much longer and be more effective than the longer ones in wider use. However, it does mean that while in use a thin line appears right in front of the driver from the middle wiper, and with the wiper at its current distance, it's a bit distracting. For family use, the FJ Cruiser is somewhat constrained by the suicide doors; to open the rear doors you have to open the front doors and reach in for a large but unmarked handle (black on black). The rear doors swing at an angle, out-and-down, which is odd but convenient. Still, suicide doors aren't common for good reason, and parking in lots can be awkward at best. The rear seats have relatively little space, but cargo room behind them is quite good. Rear seats have the same headroom, roughly, as the fronts. There are no child locks, which means kids can open their own doors once the front doors are open, which can be bad. Getting into the rear is made easier by the suicide doors, but it is still difficult, with the roof waiting to bang unwary heads. Space amenities include primitive cupholders (without any concession to narrower mugs), a big uncovered bin between the front seats, small map pockets, and an odd storage bin in front of the driver, on top of the dashboard (when open, it doesn't completely obscure the windshield). The cargo bay has a heavy duty look and feel, despite the massive subwoofer, with nonskid plastic all around rather than carpet. The rear door now opens correctly for Americans, which is to say out from the curb, and a net on the door itself can keep smaller objects (including the Toyota tool kit) in place. Four wheel drive features are more complete, with four-wheel-drive traction control, a locking rear differential (via a button), and a true low speed four wheel drive mode. The four wheel drive traction control doesn't have a button to indicate its use, but the locking rear differential lights a red icon in the panel. You can also shut off the stereo's subwoofer, a nice feature - again, though, the button has no visual indicator, and no definite feel. 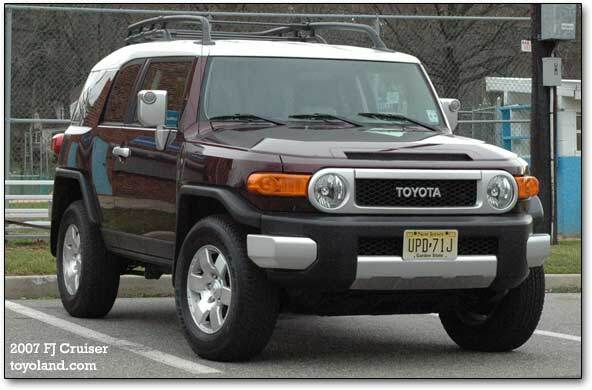 The FJ Cruiser has Toyota's usual excellent headlights, but overall visibility is lacking due to the immense size of the pillars, which produce blind spots of almost unprecedented size; the big spare tire hogging the rear window doesn't help, either. The oversized mirrors don't completely fill the gap, since they're tall but not especially wide. Fortunately, while some merges and lane changes can be hairy, backing up doesn't have to be with the optional parking warning system, which skimps a bit (no visual display) but provides an attention-getting audible indication of how much distance you have before striking whatever lies in reverse. Unfortunately, there is another visibility issue - sun visors undersized for the size of the windows (both windshield and door windows), which do not extend or slide. The FJ uses daytime running lights, so headlights are on all the time, at a moderately if not ideally reduced level. Speaking of reverse, there is no lockout; a special "bong" tells you when you're there. The FJ has six speeds, spaced fairly closely, so that sixth is in about the same space fifth would normally be in. Low end responsiveness isn’t the FJ’s strong suit, but peak horsepower and torque are both in V8 turf (245 hp and 282 lb-ft), and it doesn't take much to get passing power; just downshift (with the automatic, that's not even needed). Launches from first are easy and quick; the FJ has no shortage of power once the engine revs into its power zone. Admittedly, that power zone is fairly high up, but even at the lower ranges, it has enough power for most traffic. Cornering is about what you'd expect from a moderately large four wheel drive truck - better than most cars of the 1970s, and not as good as most cars of the 2000s. It doesn't feel heavy or ponderous, and while it's clearly not a BMW, it also isn't a Mack truck. The FJ provides more cornering prowess than most people need; indeed, it took turns surprisingly well for a moderately sized four wheel drive vehicle. The ride is generally smooth, with minor problems straightened out, but firm, so that bounces are part of the equation. In short, it feels like a well designed truck. The base 4x4 has a 239 horsepower V6 with variable valve timing and lift; full-time 4x4 with a Torsen center differential; locking rear differential; variable gear power steering; P265/70R 17 inch black steel wheels; skid plates; tow hooks and mud guards; eight-way driver's seat and four-way front passenger seat; water-repellant seats; six-speaker CD; power windows and locks; rear defogger; stability and traction control; and antilock brakes. Our test car added a few option packages with hefty prices. From most to least expensive, we have Upgrade Package #2 ($2,210), with A-TRAC (a four wheel drive traction control that gave no visual indication of operation); the dash-mounted gauges (compass, etc); alloy wheels; CD changer with extra speakers; AC power outlet; audio controls on a leather steering wheel; cruise; rear subwoofer (also without an on/off light); and color-keyed interior trim. This package was probably not worth the extra cost. The CQ convenience package, at $1,840, provided remote entry, cruise, power outside mirror with image light, rear parking system, dark-tinted glass, rear wiper, and daytime running lights. The parking system may save a fender bender or two, but again the price seems a bit steep. So does the next item, the C7 convenience package, which at $1,167 includes the roof rack, hitch and wiring harness, and spare tire cover - invaluable if you will tow, admittedly. Then we have curtain airbags with front seat side bulster airbags at $650, the usual price for those; and all weather floor and cargo mats, rear door storage, first aid kit, and armrest at $422. For a four wheel drive vehicle, the FJ Cruiser is quite reasonably priced; more so than the Jeep Wrangler and certainly more so than the weak-engined Hummer H3, and it should have better resale value, too. Its off-road capabilities are good out of the box, without much of downside, other than the usual-for-the-segment pitiful gas mileage. At least the FJ has good power and interior space, even if it sacrifices some off-road versatility; and with an automatic, gas mileage actually improves. 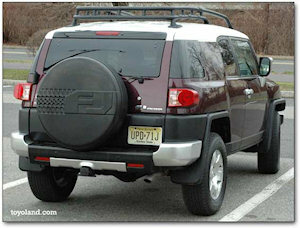 If you really miss those old Land Cruisers or Jeeps from the 1970s, be sure to check out the FJ Cruiser. It probably won't disappoint you - if you drive it with a manual transmission (the automatic will provide all the noise, but not half the enjoyment). If you're looking for a thoroughly modern vehicle with retro styling, or halfway decent gas mileage, though, the RAV4 or Jeep Liberty four-cylinder might make you happier.